Helvetica bold type, interchangeable with Avery® style legal dividers. Laminated side tabs for extra-long life. 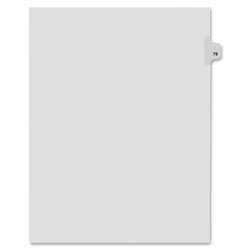 Tab Style: 1-Tab; Tab Color(s): White; Index Divider Size: 11 x 8 1/2; Form Quantity: 25. Packaging contains 20% post-consumer recycled content, 20% total recycled content. White Index Tabs and Dividers from Kleer-Fax! 25 In Stock today.